I loaded Matt’s image into the GIMP, my image editor of choice. I added a new all-white background layer. I went back to the skull layer, and using the Fuzzy Select Tool (magic wand) selected the contiguous transparent area outside the skull parts. I went back to the shading layer and cut the selected area, leaving only that shading that’s inside the boundary of the skull. As always with Gimp tutorials, it takes about ten times as long to explain as to actually do. It’s quite a subtle difference, but clear if you flip back and forth between the images (which you can most easily do by putting them in adjacent tabs of your browser). Personally, I think I prefer the 50-pixel version, since I think the shading clings rather too closely to the lines in this one, but YMMV. I’m actually rather fond of this version, but it’s a long way from the crisp, clinical feel of the original. You can thicken up the shading by duplicating one or both of the shading layers as many times as you wish (or or course thin it out by sliding down the opacity level). Its also easy to make the shading coloured: just use Colours → Levels, select the individual colour channels, and bring up their bottom levels to taste. Putting all that together, here’s one I made with very dense, yellowish (bone-coloured) shading. I did it starting with the 50-pixel shading layer, upping the red output level to 200 and the green to 150, then duplicating that layer, and reducing the 30-pixel shading layer to 50% opacity. You can play for hours with all these sliders, tweaking as you wish, thanks to the magic of layers. It’s well worth investing a bit of time to learn some of the capabilities of a program like GIMP. Matt and I are very far from wizards, but we have at least got a bit past just using it to cut out backgrounds, and it opens up possibilities. Thanks for this tutorial! I always wondered how to remove a background color from an image to make it transparent-wasn’t even sure how to ask the question. Now I can color some of my black-and-white drawings! Are we allowed to like Matt’s original rendition best? I’m sorry, Mike, but while that helps you express it as an art, it detracts from the ability to perceive detail by the process of blurring specific points. I should add that one of the best ways to get the technical look and the artistic blended aspects of shading across perfectly would be an ink wash … but these are far, far more complicated and expensive to pull off than with a typical stipple job, and thus less likely to be used for anything other than very specific illustrations. Oh, but the result…. After further thought, I’m not wild about this. 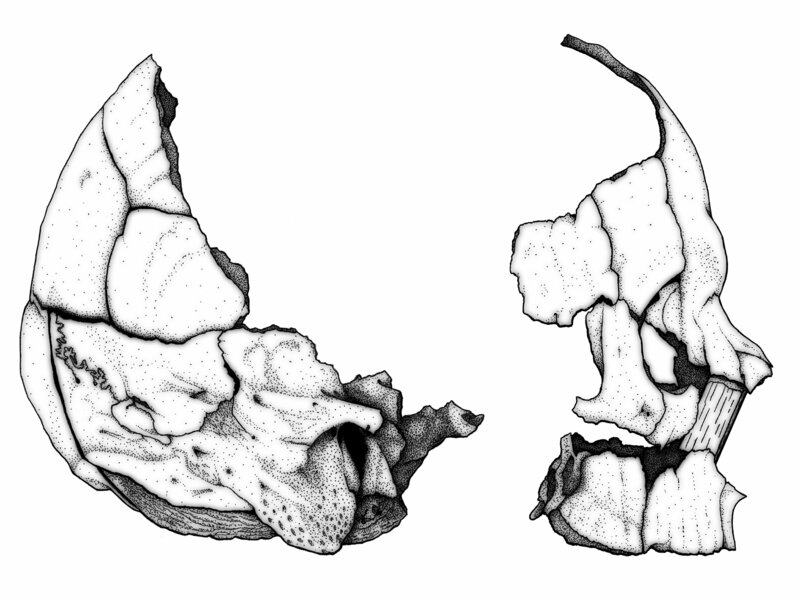 In a stippled or other traditionally-shaded illustration, it’s possible to convey overlap. 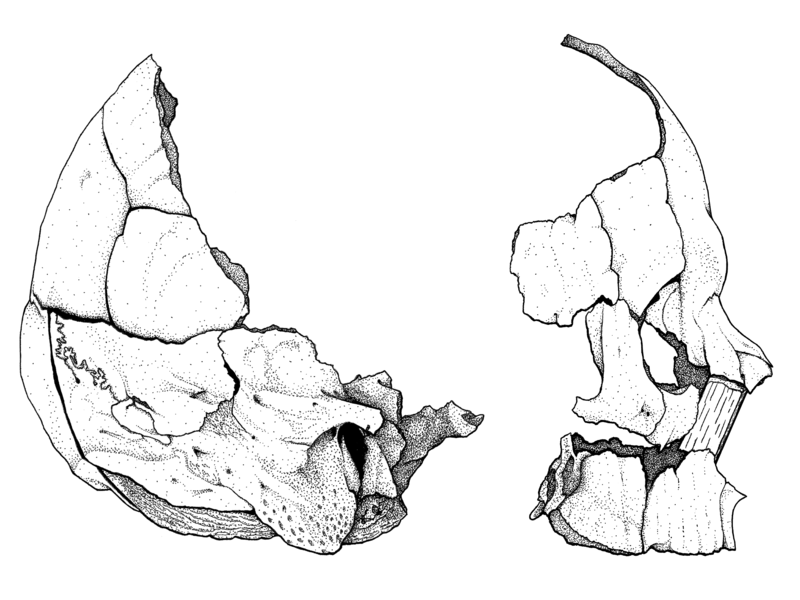 In the original illustration here, you can see that the various pieces of the parietals and occipitals overlap each other in the back half of the skull. But this shading method extends the blur from the black line in both directions, so what was once a crisp cut-off becomes shaded into an apparent downward plunge. The result is that every piece of bone looks like it is bent downward or inward at the edges, as if the skull had been assembled from pillows. Okay, that might be a little harsh, but I’m sure you see where I’m going with this. It’s a nice trick, but unless all of the bones actually meet at topographical valleys, it’s adding incorrect information to the drawing. In case you don’t want to flip between tabs, I threw together an animation. Thanks for this. It has helped me with shading in the figures of my (hopefully) forthcoming paper on fossils of British Columbia. I will post a sneak preview soon. « Vicki’s book, Broken Bones, is out!